Despite China’s size, it lacked indigenous tank development and production facilities until the mid 1950’s, when it received assistance from the Soviet Union (Russia) as both were communist nations. The Russians helped the Peoples Liberation Army construct 617 Factory, which was ready to manufacture tanks in 1956. Russia had been manufacturing the T-54 from 1946 to 1958 (when production swapped to the T-55) and it was the T-54A that they gave to the PLA for licensed manufacturing for their first tank (the T-54A was also licence built in other former Soviet States) under the Chinese designation Type 59. All tanks at some point will either break down, be damaged from attack or get stuck in some natural tramp, like deep mud, a ditch or rock obstacle. This means that it needs a vehicle of equal strength to rescue and recover it. 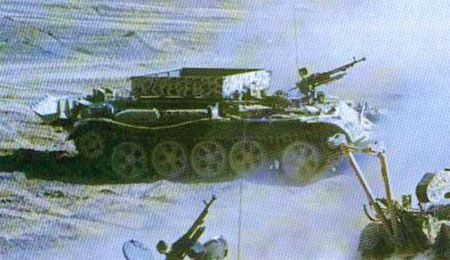 The Chinese Type 73 ARV or rather Armoured Recovery Vehicle is built on a Type 59 hull and was the first ARV the Chinese ever built for their Type 59 in the 1970’s. The recovery equipments include a recovery winch, which can provide a pulling capacity of 25 tonnes, or 50 tonnes when used in conjunction with two pulleys, and a manually operated hoist boom with a max lifting capacity of 1,000 kg. A spade can provide a max support of 54 tonnes. This means that the vehicle can winch to safety, tow and replace the engine of a damaged or stuck tank in the field. Armaments on the Type 73 includes a roof-mounted Type 59 12.7mm antiaircraft machine gun (AAMG) with 500 rounds. The vehicle also carries a 7.62mm assault rifle with 300 rounds, and 20 grenades for self-defence.